Looking at your data in relative distributions of a selected feature will give you new views and insights by revealing an alternative, relative context of your compared selections. The absolute distribution (default) enables rapid analysis of absolute data trends (by count or totals). The relative distribution reveals the selected feature distributions across all other data features. This mode applies to all your dashboard at once, so all charts will use the same distribution mode. Let's take a dataset of homicides as an example and compare trends across three regions (quadrants): SE, NE, and NW. 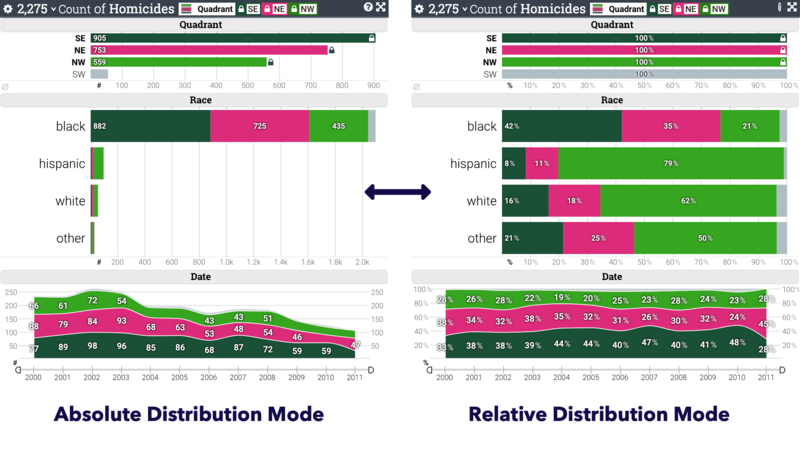 Once the three regions are locked for comparison, the absolute distribution mode shows the number of homicides in different regions per each race and date. When the relative distribution mode is used, the charts and the number labels show the relative frequency of different regions for each race, and over time. Example analysis of hispanic race cases in NW quadrant. Absolute mode: Among the 96 total cases for hispanics, 76 were in NW (green color). The green bar looks tiny because of the relatively few numbers. Relative mode: 79% (76/96) of the hispanic cases are in NW. The relative trends of distributions by quadrant are much easier to observe in the chart. Similarly, for analysis of Dates, absolute mode shows the down-ward trend of number of homicides over time, including the quadrants. However, if you use relative mode, you can better identify how different quadrants are getting safer (or not) over time. Click on the chart axis. For bar, histogram, and line charts, the control is the horizontal / vertical axis. For aggregate maps, the control is the color legend. Or, use the dashboards analytics config panel. When you remove all locked selections, the relative distribution will be disabled automatically as well. When can you use the relative distribution mode? The dashboard uses the average aggregation function. Example: You cannot see relative age distribution of different groups of people. Example: You cannot stack total of temperature values, as temperature may be negative. There is no locked / compared selection.